meantime QSI has sent us an .mp3 of some of the sounds that will be in the sound chip. The NSWGR AD60 class Beyer-Garratt was one of only two 4-8-4+4-8-4 type Garratts in the world. Fifty were ordered from Beyer, Peacock and Co. of Manchester, England, in two batches of 25, the first being placed in service in 1952 and the last in 1957. Principal specifications were 200 lb/sq. in. boiler pressure, 19¼ x 26” cylinders and 4’7” diam. coupled wheels. Modern features included long-travel Walschaerts valve gear, cast one-piece engine beds from the USA, power reverse, mechanical stoker and roller bearings on all axles and on the big end and main driving crankpin bearings. Engines in the initial batch weighed 256 tons, with a maximum axle load of 16½ tons (on the trucks), and produced a starting tractive effort of 59,560lb. After initial service revealed that the 14-ton bunker capacity was insufficient for through runs to Goulburn, the second batch was built with an enlarged coal bunker holding 18 tons of coal, which raised the total weight to 263 tons. The earlier Garratts were altered to conform, but the addition to the back of the bunker was always visible. A number of circumstances conspired to cut delivery of the second batch to 17 complete locos and five sets of spares, so that the class ultimately totalled 42 engines, numbered 6001-6042, Beyer, Peacock builder’s numbers 7473-7497 and 7528-7544. The last to enter service was 6040, on 2 January 1957. Although ordered as ‘go-anywhere’ units with a branchline axle load, they were initially pressed into intensive mainline service between Enfield and Broadmeadow. Other areas in which they saw extensive service were between Enfield and Goulburn, between Lithgow and Parkes and Dubbo, and up the Hunter Valley as far as Murrurundi. Union bans on running through single-line tunnels precluded their use on the Illawarra and north of Murrurundi, while a deficiency in braking capacity (partially remedied by the fitting of brakes to the inner bogies) made their use on the Blue Mountains uncommon. They reached Narrabri, Werris Creek, Narromine from both Dubbo and Parkes, and ran down the main south beyond Goulburn on occasions, reaching Temora and Narrandera in the south-west. Thirty locos were modified by the boring out of their cylinders to 19 7/8“ diameter, thus raising their starting tractive effort to 63,000lb, which necessitated the adjustment of the weights so that 18 tons rested on the coupled axles. Those so modified, commonly called ‘Heavy Garratts’, were identified with a ‘‡’ indication after their number on the front and rear. All of these, and a couple of others besides, were also given duplicated driving controls, so that the driver could face the direction of travel when running bunker-first. These were indicated by the addition of a vertical ’DC’ lettering before the front and rear numbers. Other visible modifications were the fitting of ‘sound intensifier tubes’, which ran from cones ahead of the leading truck wheels, across the top of the tank and alongside the boiler to the cab, allowing the crew to hear detonators on the track and the closer placement of the vent pipes on the top of the front tank from very early in the piece. Garratts originally carried a pair of screw jacks above the buffer beam at each end, but these appear to have vanished as the years passed. All were originally fitted with Stone’s electric headlights, but during overhaul in later years some acquired NSWGR standard Pyle National lights. Maximum permitted speed on main lines was 40mph, although they were quite capable of exceeding 60mph and have hauled the ‘Newcastle Flyer’ in emergency without significant loss of time! The loads hauled by the Beyer-Garratts were substantial. The through load for a ‘heavy’ Garratt from Enfield to Broadmeadow was 650 tons, or 1000 tons if assisted by a Standard Goods 2-8-0 or a 59 class 2-8-2. From Broadmeadow to Muswellbrook, 775 tons was the maximum load, and from there to Murrurundi 650 tons. On the return, 1150 could be taken right through from Murrurundi to Broadmeadow, reducing to 1000 tons on to Enfield and assisted up Cowan Bank. Through loads on the south were 900 tons from Enfield to Goulburn, 560 tons thence to Demondrille, and 825 tons from there on to Wagga Wagga. Loads of 560 tons could be taken to and from Bungendore on the Cooma branch and up to 1400 tons on the Narrandera run. On the west, loads varied from 600 tons up Tumulla Bank’s curvaceous 1 in 40s, west of Bathurst, to 1100 tons between Bathurst and George’s Plains. The through load from Lithgow to Orange was 900 tons, with assistance up Tumulla Bank. 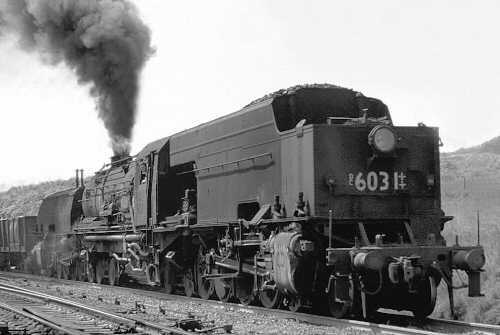 In the 1960s, the only permitted instance of double-headed Garratts was on W44 ore concentrate train from Broken Hill to Cockle Creek. This through load of 1020 tons was worked by 49 class diesels to Parkes, thence by a Garratt and a 36 to Molong, where the 36 gave way to a second Garratt for the difficult climb to Orange East Fork. From Orange to Lithgow, the assistant Garratt from Molong, running bunker-first, took the train on alone. Electric haulage was provided between Lithgow and Gosford, with the final leg thence to Cockle Creek in the hands a Garratt and a Standard Goods 2-8-0, a 35 or 36 4-6-0, a 38 class Pacific or a 59 class Mikado. 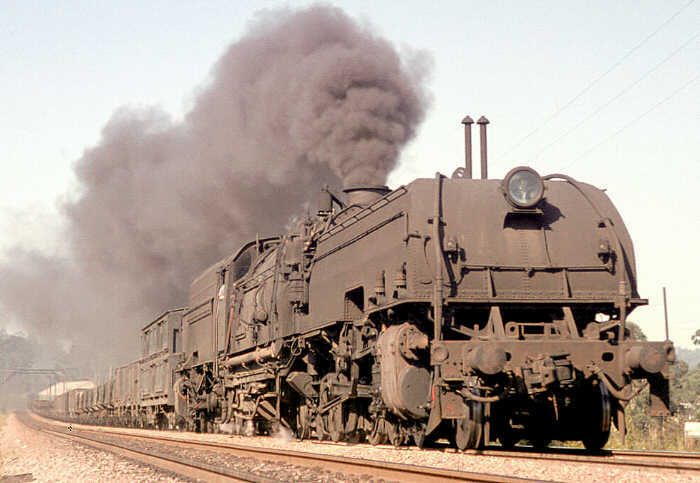 In the late 1960s, double-headed Garratts were permitted between Gosford and Broadmeadow, and were particularly to be seen on the heavy coal working out of Newstan Colliery at Fassifern until steam’s finale at the end of 1972. When placed in service the Beyer-Garratts were painted black, with single red lining on the tank, bunker and cab side panels, and red buffer beams. Numbers in brass on the cab were to the NSWGR’s standard ‘contractor’s style’. White painted numbers were originally placed on the front buffer beam, but these later migrated to the tank front and changed colour to buff; occasionally both styles co-existed on the same engine. The rear number in buff was always been on the rear of the bunker. After the first overhaul, unrelieved black was the standard livery, usually liberally encrusted with road grime. An exception was 6020, which was specially painted for display at Central station during the NSWGR’s centenary in 1955, with red and cream lining and a silver cab roof. Late in their lives, 6029 and 6039 received the original red lining in conjunction with their use on enthusiast special trains. The first withdrawal was 6012 in February 1955, as a result of accident damage. Otherwise, withdrawals took place in the mid- to late-1960s, with 6042 being the last to go, on 4 March 1973. The highest mileage reached was by 989,719 by 6009 in a running life of 19 years and 7 months. Four 60 class have been preserved: 6029 by the ARHS Canberra, 6039 and 6042 by the Dorrigo Steam Railway and Museum and 6040 by the NSWRTM at Thirlmere, though, regrettably, none is in running condition.